The Beatles spent the week of January 27, 1964, continuing with their three-week engagement at the Olympia Theatre in Paris, France. The bill included the popular French female vocalist Sylvie Vartan and American folk singer/guitarist Trini Lopez, who burst upon the scene six months earlier with his worldwide hit If I Had A Hammer, as well as acrobats and jugglers. During this week the Beatles played two shows each day. Their set included From Me To You, Roll Over Beethoven, She Loves You, This Boy, Boys, I Want To Hold Your Hand, Twist And Shout and Long Tall Sally. During their stay in Paris, the Beatles spent time on January 29, 1964, recording German-lyric versions of I Want To Hold Your Hand and She Loves You at EMI Pathe Marconi Studios. The recordings were made at the request of the production manager for EMI’s West German branch, Electrola. 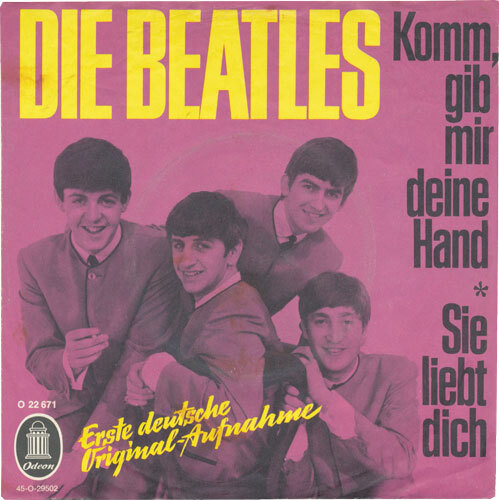 A single containing Komm, Gib Mir Deine Hand and Sie Liebt Dich was released in Germany on March 5, 1964. The German lyrics were written by Camillo Jean Nicolas Felgen, who wrote under various names, so the writer credits for the songs falsely give the impression that the songs were co-written by different pairs of German lyricists. On the morning of the scheduled session, the Beatles failed to show up and had their road manager tell a furious George Martin that they had decided not to go to the studio. Martin took a taxi to their hotel and demanded they get dressed and get to the studio. The session went so well that the group had time to record an additional song, this one in English. 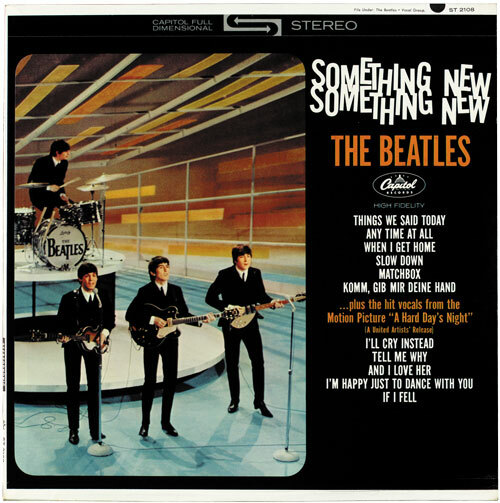 Meanwhile, over in America, the Beatles were getting saturation air play with not only I Want To Hold Your Hand and She Loves You (the two songs they had redone with German lyrics), but also with Please Please Me. Some radio stations were even playing songs from the albums Introducing The Beatles and Meet The Beatles! The singles and albums were selling at record rates (pun intended). She Loves You and Please Please Me were chasing after I Want To Hold Your Hand, which sat at the top of all the national charts and most of the charts published by local radio stations across America. Both albums were also beginning their vault to the top two positions on the charts. By this time word had spread throughout the land. The Beatles are Coming! The Beatle Are Coming! This week’s questions cover the Beatles German-lyric single. What was the first Beatles German-lyric song released in America? By what record company and in what format was first German lyric Beatles song released? By what record company and in what format was the second German lyric Beatles song released? 1. Sie Liebt Dich was the first Beatles German-lyric song released in America. 2. 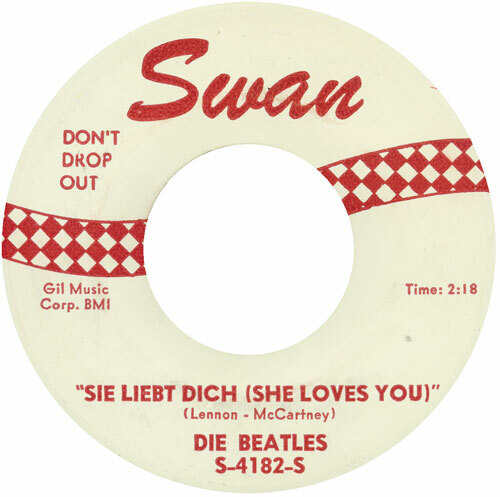 Sie Liebt Dich was issued by Swan Records on a 45-RPM single paired with I’ll Get You, which was the B-side of the label’s She Love You single. The label credited the song to “DIE BEATLES.” The disc was issued on or about May 21, 1964. When Capitol sued, Swan agreed to stop manufacturing and distributing the single. 3. Komm, Gib Mir Deine Hand was issued by Capitol Records in the LP format on the Something New album, which was released on July 20, 1964.